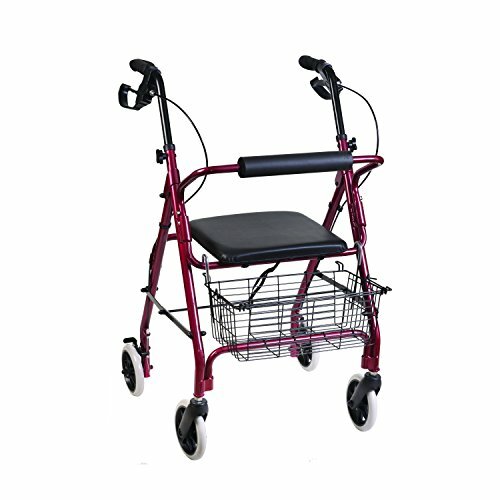 This rollator is called our Freedom model for good reason. The front swivel wheels turn easily in any direction, making it easy to maneuver, even in tight places. And its lightweight construction makes it easy to push, giving you the ability to go as fast or slow as you want. Just press on the bicycle-style handbrakes to instantly stop. It makes a great companion around the house or while out and about. The convenient basket is great for holding your purchases while shopping or the personal items you want to take from room to room at home. The flip-up cushioned seat is always ready and waiting when you need to rest. This rollator was created with your convenience in mind. Going shopping? Use the storage basket to store your groceries. Afterwards, lift the seat and pull the strap to fold. It is easier than ever to travel with this rollator! Just stow it away in the trunk of your car. The aluminum construction makes it lightweight – only 15 pounds! Yet it can support up to 300 pounds. Wearing your shoes, naturally stand upright inside the rollator. Put your arms to your side with a natural bend at the elbow. Have someone measure the distance from your wrist joint to the floor. This is the height your rollator should be set at. Place your hands on the grips. Your elbows should comfortably bend at a 15-degree angle. This lightweight rollator will be there when you need some extra support, but won’t slow you down in the least. It’s easy to “drive” and steer, moving smoothly over carpets, floors or pavement. Its front wheels turn easily in any direction, giving you great maneuverability, even in tight spaces. Whether you use it or home or on the go, you’ll find many uses for the convenient 2-position storage basket that hooks below or behind the seat. The rollator folds easily with a simple pull on the strap under the seat; makes a great travel rollator. The cushioned flip up seat with padded backrest gives you a comfortable place to rest. 6 inch wheels travel easily over most surfaces. This lightweight rollator will be there when you need some extra support, but won't slow you down in the least. It's easy to "drive" and steer, moving smoothly over carpets, floors or pavement. Whether you use it or home or on the go, you'll find many uses for the convenient 2-position storage basket that hooks below or behind the seat.